I greatly recommend the tour in your old Volkswagen van. Very iconic vehicle with a very cheerful and funny tour guide is a great combination. I will surely take another tour with your company. This is the best tour we have done....ever, and we've done a lot. Chad our driver was nothing short of excellent, and he's knowledge of San Fransisco was above what we have experienced anywhere. We went to areas of the city where the larger bus tours couldn't get to, he showed us a side of the city that many wouldn't see and gave recommendations to places to eat, explore and drink. 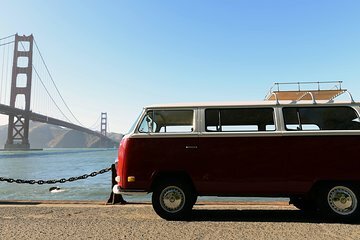 To see San Fransisco in the VW was another experience within itself, I couldn't think of a better way. Any readers of this do yourself a favor and take this tour you will not be disappointed, above 10 out of 10, thanks for the experience.